يوفر كراون ميتروبول مكان إقامة فاخر في ساوثبانك في ملبورن. ويمكن للضيوف الدخول إلى البار والصالة الحصرية التي توفر إطلالات بانورامية على المدينة. فيما يضم السبا مسبح لا متناهي يبلغ طوله 25 متر. تتميز جميع الغرف الفسيحة بديكور عصري وأنيق وإطلالات رائعة. ويتوفر تكييف هواء وتلفزيون بشاشة إل سي دي. ويضم الحمام دش كبير ومنضدة كبيرة للتزين وستائر للخصوصية. تشمل خيارات تناول الطعام في كراون ميتروبول ملبورن Mr Hive Kitchen & Bar. يتميز الفندق بمسبحين وصالة داخلية للاسترخاء على تراس التشمس ومركز للياقة البدنية ذو مستوى عالمي. يقع كراون ميتروبول بجانب مجمع كراون الترفيهي ومقابل مركز ملبورن للمؤتمرات والمعارض. ويقع على بعد 10 دقائق سيرًا على الأقدام من محطة ساوثرن كروس ودوكلاندز. يُرجى ملاحظة أنه يتم تطبيق تكلفة بنسبة 1.2% عند الدفع ببطاقة ائتمان. تتوفر إمكانية التسجيل في الفندق وتسجيل الوصول فقط للضيوف غير المحظورين من دخول الفندق والذين تبلغ أعمارهم 18 سنة أو أكثر، كما يتم تسجيلهم في الحجز في وقت الحجز. يجب إبراز بطاقة هوية سارية تحمل صورة شخصية عند تسجيل الوصول، وسيتم تسجيل ذلك من قبل مكان الإقامة. يجب على الضيوف الذين يدفعون نقدًا أو بواسطة بطاقة EFTPOS أو بطاقة السحب دفع مبلغ الإقامة بالكامل عند تسجيل الوصول (إن لم يتم دفعه مسبقًا)، بالإضافة إلى مبلغ إضافي قدره 200 دولار لليلة الواحدة كضمان لأي رسوم طارئة، بما في ذلك التلفيات التي تحدث في الغرفة. سيتم إجراء عملية تفويض مسبق على بطاقة الائتمان عند الإقامة في الغرف البريميوم بقيمة 500 دولار لليلة الواحدة، بحيث لا تتجاوز 2000 دولار للحجوزات التي تمتد لأكثر من 4 ليالي كضمان لأي رسوم طارئة، بما في ذلك التلفيات التي تحدث في الغرفة. سيتم إجراء عملية تفويض مسبق على بطاقة الائتمان على جميع أنواع الغرف الأخرى بقيمة 100 دولار لليلة الواحدة كضمان لأي رسوم طارئة، بما في ذلك التلفيات التي تحدث في الغرفة. يجب على الضيوف دفع تكلفة المشتريات التي يتم شراؤها خلال فترة الإقامة عند طلبها. We booked 4 rooms with a large group for a family birthday, the manager actually checked us in and upgraded us to a loft suite and provided us 2 bottles of champagne so we could all celebrate together looking over the city! It was an awesome afternoon and evening! Three issues: Firstly, there were only 2 staff at concierge when I was checking in with a huge line up. Had to wait around 15 min to get served. Secondly, my request to have a room with the bed on the right as I walk in seemed to be difficult to look up as well as provide. Staff member couldn't promise bed on the right as she assumed all beds were on the left. I've started there a few times. and know you have beds in the right. After entering room, I called room assistance 2x without a call back so I went back down to concierge, and because they were short staffed, staff member was under pressure and seemed rattled to try and fulfill my request, so I told him to not worry about it. Thirdly, should also bring to your attention that brown dirty water was running out of the hot basin tap when I first turned it on. It dissipated after I let it run a while. Overall always a pleasant stay. I checked in to hotel and found out the location is excellent. 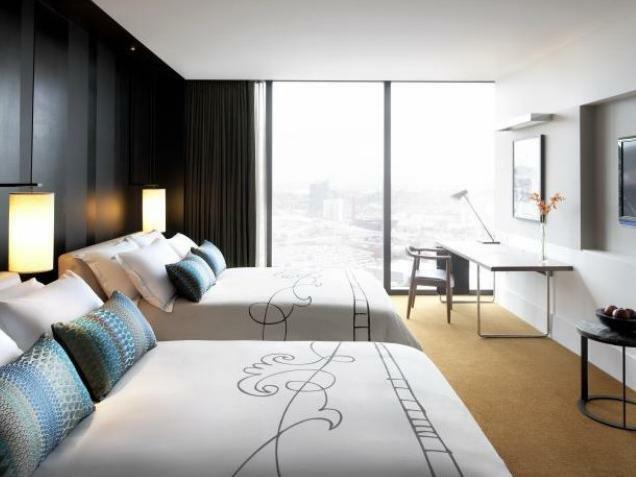 It has integrated shopping, dining, casino and near by tram to access city centre. Staff also very friendly and the room is quite big enough for a family of two children. The hotel was overbooked when we were there in December but the staff tried valiantly to cope. The housekeeping was sometimes a little slow and our room didn't get cleaned until after lunch. The pool was standing room only so we didn't get to use the facilities. It was a nice holiday but it wasn't that relaxing because it was just so busy and crowded all the time. FANTASIC STAY WELL LOOKED AFTER ROOM WAS FANTASTIC NOTHING WAS TO HARD BREAKFAST WAS WONDERFUL. I STAY AT A LOT OF OUR-FIVE START HOTELS IN SYD-MELB THIS PLACE RANKS WITH MY TOP TWO NEXT RESERVATIONS.WELL DONE. Spacious rooms and bathroom. Great location. Have stayed here twice for the final weekend of the Australian Open and it's a winner. The hotel room itself is great, with a nice sliding wall in the bathroom if you'd like some sunshine and TV while sorting your teeth and hair. The Metropol also has a cosy entrance to the rest of the Crown complex, which itself has some solid dining options, from a nearby food court with Macca's and KFC, the very decent Gradi Italian bistro to Heston Blumenthal's restaurant, it's an easy stroll across the bridge to the city and an easy tram ride to the tennis. It's even a reasonably easy walk to Rod Laver Arena, if you want to avoid the taxi queues (handy on the evening walk back after a Final!). 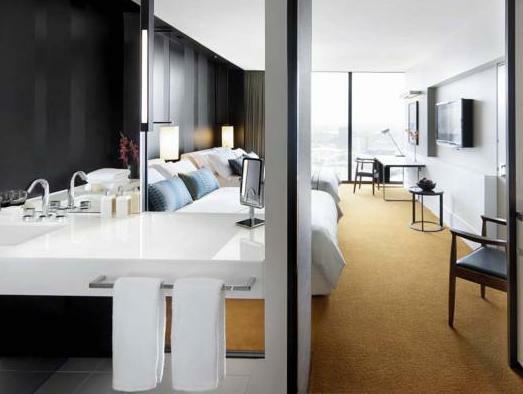 Crown Metropol is one of the best hotel I have ever used and it gave me good memory about Melbourne, I have a pitty, I haven't got any chance to use its breakfast. All my travel goes to airport early next morning. Fantastic breakfast at Mr Hive Kitchen. Close to everything we needed to use (including Casino, of course). All the facilities one would expect from a Crown. Really enjoyed our stay here. Highly recommend to everyone. great luxury hotel at affordable price. it's the entry level for Crown Hotel. the room was great, large bed, spacious, & very comfortable. even if you don't have car, it's just 2 minutes walking distance from tram stop to city. the only minus point is not much food around.. only mc donalds which is within 5 minutes walking distance. From our first encounter at check-in with a trainee staff member to checkout the next morning, we thoroughly enjoyed our stay. The room was all we'd hoped for with the Crown label. We visited Bar 28 for a few pre-function drinks and were extremely pleased with the surroundings, ambiance and stunning view and enjoyed a room-service breakfast the next morning, delivered right on time. The only thing lacking there was butter for the toast - no biggie. 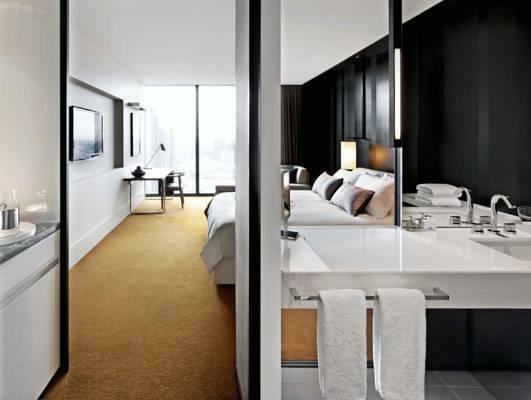 Comfy bed, large shower with good pressure and delightfully fluffy robes along with a fantastic view over the Crown complex and Yarra River from our 25th floor room. Customer service was very average. Rang reception to ask a question no one answered the phone despite several long attempts. On our 2nd night we heard a very loud bang and felt like a major accident with the building had taken place. We thought it was in our bathroom. We heard noises continue afterwards, we were left so stirred by this we couldn't sleep. We rang the front desk to find out what happened but they said nothing was reported- did say they'd check with maintenance but no one thought to get back to us to out us at ease. Had the worst sleep that night! Next morning at checkout we mentioned this & found out it was a shower screen door above us that smashed!!! Couldnt believe we had to pay to watch old movies!!! We were in a king deluxe room!!! we wasted 3hrs on the first day since the check in staff lied to us the level 24 room has a bay view? but there was no view of the bay except for tall towers. and upon requesting them to give us a call to change the room we had to wait for 3hrs . finally I had to go down to the check in counter and explained we were not happy with the room. the arrogant staff kept pushing over us that unfortunately she cant help us. when we requested for full refund than the reservation manager steps in and shows us a option on level 17 which was okay. the point Im making here is for a 5 star hotel the the staff should be accommodating to guest request and be helpful rather than making it difficult for the guest. Bed comfy as should be. View dismal. Shower head very under whelming. Like staying in Bali waiting for hot water to kick in. Hot water tap dribbled out. Towels thick and white as should be. Check in and a long que not expected. What happened to wowing someone, making an impression? Cold wet Melbourne day. Welcome drink? Hot cookies? Something to say gee thanks for waiting, Uni are special and thanks for choosing us. You get better experiences with smaller chains. Very arrogant and uninteresting stay. Awesome room, great location. We stayed for our anniversary and the lady at check-in organised a complementary bottle of champagne. Was a very nice surprise. Will stay there again next time we stay in the city. The rooms should have more modern shower facilities.